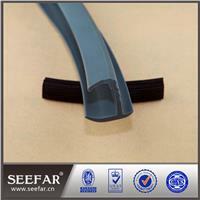 Butadiene Rubber (BR) Strip is supposed to be the most elastic rubber type. The chemical name of this rubber is Polybutadiene. This rubber is polymerized butadiene. A typical application is a blend of BR and natural rubber in truck tires. The major use of butadiene rubber is in tires with over 70% of the polymer produced going into sidewalls and treads. 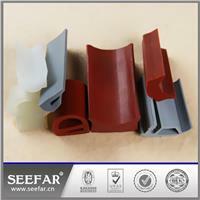 This rubber is usually combined with other elastomers like natural rubber or SBR for tread compounds. It also has a major application as an impact modifier for acrylonitrile-butadiene-styrene resin (ABS) and polystyrene with about 25% of the total volume going into these applications. Typically about 7% of this rubber is added to the polymerization process to make these rubber-toughened resins. Due to its outstanding resiliency, it is estimated that about 20,000 metric tons worldwide of “high cis” polybutadiene is used every year in golf ball cores. This application is widely growing because the golf ball industry seems to be moving away from the traditional wound ball technology to the two-piece, solid core construction, made of BR, in combination with other rubbers. The butadiene rubber is and will continue to be a high volume rubber for use in toughened plastics, tires, and golf balls due to its low cost, availability and unique properties. Chengdu Senfa Rubber Plastics Co. Ltd.,established in 1995,has been always committed to providing customers with innovative solutions of high performance sealing plastics,which is a collection of manufacturing,researching and developing,selling for the integration of high-tech enterprises, with special rubber products prompt response terrace.At the beginning of the sealing material industry,we get involvedwith high standard to produce rubber sealing plastics such as workshop planning,personnel,equipment,marketing and so on, that have differences from traditional rubber,plastic manufacturers, and set up a high-performance sealing materials research and develop platform. 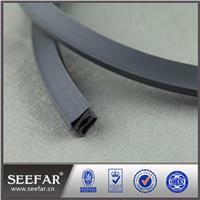 We carefully select and use the high-performance sealing plastics,which are world famous enterprises produced and highly evaluated, integrating with particular formula our company independently self-developed,for instance,thermostability,low temperature resistance,anti-corrosion,high pressure resistance,abrasion resistance,etc. to meet the consumers’ demands. The company currentlyhas 3 subsidiaries, 1 branch, and 1 technology research and development center. Existing more than 300 employees, and the value of production equipment has reached 50,000,000 yuan, covering an area of 40,000 square meters,business throughout the country and Southeast Asia, with a wide range of comprehensive and creative products and service, which make contributions to industry and machinery,building and construction,communication and electric power,and many other fields.According to technology,production,marketing,we could provide all-around service for you,reasonable price,prompt delivery,usingthe way of small scale production to satisfy various usage,also small order quantity is acceptable,and for your special technical matters,technicians would customize and make some practical and ingenious plans. We would do it all for helping clients getting succeed. The products our factory produced are as follows:FFKM,AFLAS,FKM,FVMQ,PVMQ,MQ,HNBR,PEEK,PTFE,PEI,PA,PPS,etc. high polymermaterial.And the applications of usage include aerospace,semiconductor,chemical processing,and any traditional industrial market.Business of Senfainvolved in all aspects of life,as long as you have a look atyour home or working place attentively,you must find many materials. If only we get the drawings,samples or working condition, we are able to provide you with products processing services.